Need an easy-to-use DIY website builder with e-commerce options and hosting in one package? Read our review of uCoz to get important facts before you make your choice. Not everyone who wants to build a website is a fully-fledged developer able to code a site from scratch. Then again, not everyone who builds a website wants to be restricted by the fixed templates and themes of a typical CMS. Looking for a sweet spot somewhere in the middle? Then uCoz is the ideal solution. By combining robust and intuitive web tools with a fully supported script editor, uCoz offers one of the most flexible and feature-rich site builders available. With hundreds of customizable themes and ready-to-use modules, uCoz is designed to help bring to life your ideas for a blog, a business website or an e-commerce platform, regardless of your site building experience. uCoz offers web hosting plans ranging from free to affordable, with unlimited storage, and custom domains. A powerful control panel is available on all plans. uCoz is not the kind of business which publishes an in-depth company history online — not on its English-language site, at any rate. What we do know is that uCoz was founded in Moscow in 2005 by a group of Russian software developers. Since then it has grown to be a major player in the Russian internet market, securing backing from email and social media giant Mail.ru and Yandex, the biggest Russian-language search engine. Globally, it has expanded to offer services in 13 different languages, including English, focusing its operations in Europe, the Middle East, and Central Asia. It currently has 1.2 million active websites built on its platform. The core uCoz product is its eponymous site builder, which is absolutely stacked with features, making it one of the most comprehensive and powerful platforms of its kind around. Personal: The main uCoz builder with all features included. Business: The ‘uKit’ drag-and-drop builder has no script editor. It is aimed at helping SME owners with no development experience get a professional-looking site up and running quickly and easily with business-focused templates. Online Shop: The ‘uShop’ solution provides additional e-commerce templates and payment platforms – more detail below. The decision to target a building tool at businesses without the code editing options is slightly curious as it takes away much of the control and flexibility of the main platform. Don’t be put off, however — the main uCoz builder is more than capable of creating sites for all use cases, business or otherwise. Whichever option you choose, getting started couldn’t be more simple. All you need to do is sign up and you can start using the site builder, free of charge, straight away. It is easy to have a love-hate relationship with pre-loaded page templates. On the one hand, they make it easy for the average Joe to get started building sites. On the other, they can feel very restrictive, and the designs are often just plain tacky. The pre-designed templates uCoz offers are actually pretty good. There are hundreds to choose from, all neatly categorized and easy to search. So, if you want to build a music site, there are a bunch of templates under music, a foodie site, search under food and so on. And different template categories appear if you choose the business uKit or e-commerce uShop builder platforms. The thing to remember about uCoz templates is, they are highly customizable. Treat them as design suggestions, not restrictive parameters. The drag-and-drop builder lets you move elements around freely, you can create new sections or widgets, delete what is already there or edit how they appear on a page. Once you get going, it is easy to make the pages look like your own. And if you have the coding skills, the script editor allows you to customize the templates completely. If even after all of this, you really don’t like any of the standard templates, you can purchase a premium template from the online store. Example of a premium template, available at low cost from uCoz. All uCoz templates are built according to responsive design standards, so you don’t have to worry about navigation or how easy it is to access content — that has all been done for you. You can, however, build your own horizontal and vertical menus. You also automatically get a mobile-optimized version of your site. If templates are the foundations on which you build your site, the uCoz modules are the tools and materials you use to craft the structure. With 20 to choose from, this is where you get down to the nitty-gritty of adding and arranging pages, posting and managing content. As part of the Control Panel, Modules also functions as the main CMS for adding and altering content once your site is built. In addition, there are more management-focused modules such as SEO and Statistics. Each module has its own control menu, all of which are designed to be as easy to use as possible. So, under the Site Catalog and Page Editor modules, you can create new pages and sub-pages with a single click, rearrange them in the directory, and then drop them directly into the CMS or script editor to add or change content. The Site News and Blog modules allow you to post fresh content quickly and easily in the same fashion. The Forum module allows you to create comments sections on pages, or a complete dedicated forum section, with full control over moderator permissions. The File Catalog and manager acts in place of a site database. There are also modules to add things like search tools, live chat boxes, and mail forms. If you sign up to build a site with uCoz, even if you choose the free hosting option, you get full access to the company’s own Control Panel. It compares favorably with branded management platforms like cPanel. The Control Panel is the main interface you use to everything connected with building and managing your site. As well all the different Module options, this is where you access the templates, manage users, settings, and security, and also run administration for your account. You can make extra purchases and get online help with your site too. As with most things in uCoz, the navigation is well thought out and everything is very easy and intuitive to use, making your life as a web builder or host much easier. Search engine optimization (SEO) is one of those things even experienced web programmers wince at when it is mentioned. Building a site is one thing, but how on Earth do you get your head around the Google algorithms to make sure your site appears high in the search rankings? Have no fear, uCoz has thought of that too. You can change the name, URL and metadata settings of your pages/modules any time you like. Not sure what those do exactly? No problem, all you need to do is fill in a few text fields, and uCoz also gives you tips on what works well. It also manages server-side 301 redirects, which make sure you keep search engine position even if you move content from one page to another, simply by ticking a box. As well as SEO, uCoz also gives web owners a helping hand with that other mysterious realm, social media. There is a fantastically easy publisher which will automatically export new blogs and news to Facebook, Twitter and so on, and even update your Instagram page with new photos from your site. All you have to do is click a button to connect the accounts and select the groups you want to post to. You can also build and insert buttons on any content for visitors to like and share on social media, and you can set up comments and feedback through social media too. UCoz understands that not every website is a one-person band, especially if it is being run by a business. It makes registering users via its global authorization system very easy, and you can even customize the registration form to select which details new users have to submit, and in which step of the set-up process, they have to give it. Log-in to the uCoz platform can also be linked to users’ social media accounts. Permissions for what users can do on the site is simply a case of toggling buttons on and off. To speed this up, you can assign users to different groups with shared permissions. There are different levels of security to choose from for logging into the Control Panel including one based on geolocation, and a 2-step verification process if anyone tries to remove a module and/or significant content. APIs for third-party applications are supported in 11 of the 20 modules. uCoz has an API Key feature which only allows users with specific permissions to enable APIs. UShop is a customized version of the uCoz builder especially tailored for e-commerce platforms. Whether you just want to run a single sales page on your site or are launching a full-blown web shop, uShop provides a wide range of sophisticated tools covering all the additional functions you will need, from product listings to payment. Availability monitoring and stock management. Bank payments are supported on all uShop sites, and it is also compatible with payment platforms such as PayPal, WebMoney and SMS Coin. You can also add plug-ins for delivery rate calculations and to assign delivery direct to a courier, and you can set up Google Analytics to provide order management, tracking, and statistics. Tip: Google Analytics can be a powerful tool for boosting your e-commerce results. Learn how to create a measurement plan and set up goals and revenue tracking by taking one of Google’s free online courses via their Google Analytics Academy. UCoz offers six hosting plans, including free hosting and a dedicated plan for its uShop e-commerce platform. Free hosting is basic. You get FTP access, a maximum of 10 news or blog posts to link to social media a day, and a maximum file loading size of 15 MB. What you don’t get is Ad-blocking, anti-virus or back-ups. You also cannot remove uCoz branding, and your site may be deleted if you leave it inactive for too long. So, although it costs you nothing, the free plan is only suitable for a very basic personal site, or just to give you a platform to play around with the site building tools. Things do improve quickly once you start paying, though. And with the all-in premium plan costing just $15.99 per month, none of the options exactly break the bank. Here is an overview of the key features available. UCoz uses storage as an incentive for web hosts to stay longer and build bigger sites. In theory, there is unlimited storage available on every plan — but you have to earn it. Each plan starts with a fixed storage amount, starting at a meager 400 MB on the free plan, up to 20 GB on premium. This limit, however, will grow the longer your site remains active and the more traffic you get, with no ceiling. That’s the theory, at least. Back-up of the five most recent versions of your site, every three days. UCoz lists dozens of business and hobbyist sites using the platform. Check out their list of most popular sites here, organized by site topic. The two cheapest paid tiers get basic anti-virus protection, while the three most expensive, including the e-commerce plan, get premium protection. There is no detail about what the difference between basic and premium protection is. Ad-blocking is available on all but the two cheapest plans. Standard and e-commerce plan subscribers get free custom domain transfers if they pay for 12 months up front. Premium plan subscribers get free transfers if they pay for six months up front. Maximum file upload size on paid plans ranges between 60 MB and 135 MB. The top three plans have PHP support included. The top three plans allow you to remove uCoz branding and copyright from their site completely. Only the top three plans support mobile optimization. UCoz has fingers in quite a few internet pies, so aside from its main business of providing a site builder and web hosting, it offers several other related services. As an extension of the social buttons tool found in the site builder, uCoz makes this service available as a standalone service for any site. As well as creating share and like buttons for all major social media platforms, you can change the meta tags in your sites HTML header code to specify exactly which part of a page you want to be shared — for example, the first picture on the page with the first paragraph as an excerpt. UCoz also offers a bespoke profile builder which can be linked to your various social media pages. The builder will pull information about you from your profiles and you can then combine it all into one customized design, before linking it back to your social pages. UCoz also has its own free-to-use web browser built on Chromium. It provides ad-free browsing, with full integration to all other uCoz services, automatic updates and advanced extensions for webmaster control. As with many site building services, you shouldn’t expect a great deal of hands-on service management from uCoz. If you are looking for someone to help run your website for you, look elsewhere. The main purpose of uCoz is to provide all the tools you need to create and manage your sites yourself, and with its feature-rich building and CMS platform, and user-friendly Control Panel, it does a pretty good job. UCoz does not provide any telephone support on technical issues. According to its User Agreement, support is only provided in writing after a customer contacts the service team either via email, the submission form on the website contact page, or through the support menu on Control Panel. Support is only provided on registration issues, the functioning of the uCoz service and retrieval of a lost password. uCoz reserves the right not to provide support on any issue. 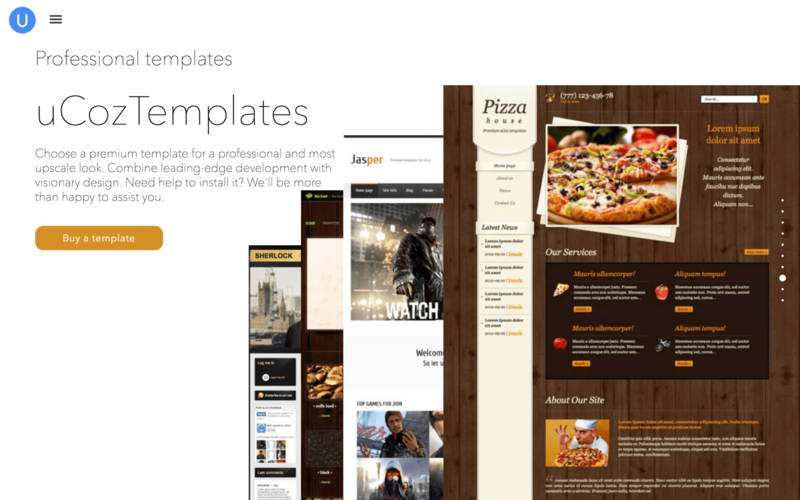 Example of a premium store template, available at low cost, from uCoz. For most issues, you may want assistance with, for example, advice on how to use a particular tool or undo an error, your best bet is to consult the uCoz’s online FAQ. It is comprehensive, with dedicated sections for every module plus a range of general issues ranging from registration to using PHP and APIs. There is also an active forum, video tutorials, a blog which contains regular service and technical updates, and Facebook and Twitter pages. UCoz also offers a free e-book to download with comprehensive step-by-step instructions for building a website. UCoz declares a 99.99% uptime guarantee, but there is no indication as to how this is measured or what happens if this target is not met. It is also worth noting that the User Agreement states that the service is provided “as is,” with no guarantee of uninterrupted service. Free site builder with a huge range of tools and intuitive drag-and-drop interface, making it straightforward for anyone to get started with creating a website. Fully customizable templates and coding support for developers who want to shape their own sites. Comprehensive e-commerce site building option with unlimited product listings, pay platform integration and order tracking. Minimal technical support offered in writing only. No support for MySQL despite having a developer platform. You are here: Home > Website Builders: All The Top Builder Brands Ruthlessly Reviewed > uCoz Review: Easy-to-Use Site Builder But is There a Catch? Previous: Cindr Sitebuilder Review: Bad For Developers. Here’s Why It Might Be Good For You.